1. Click [Windows] + [R] and type gpedit.msc in the Run window. 2. Under Computer Configuration expand the Administrative Templates. 3. Go to Network and click the "QoS Packet Scheduler" tab. 4. 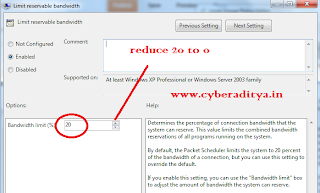 Double-click on "Limit Reservable Bandwidth" and enable it. 5. 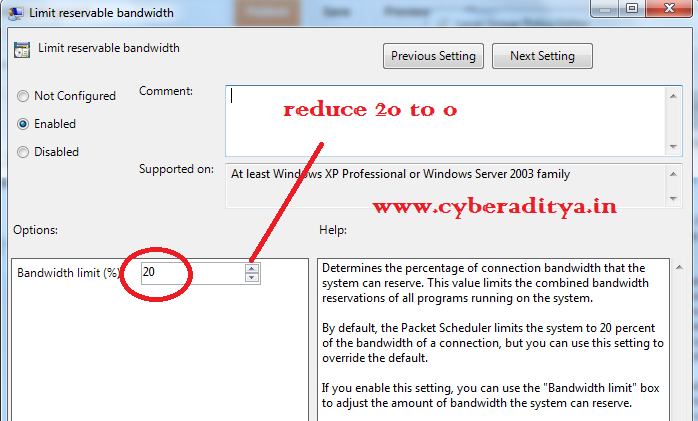 Finally change the Bandwidth limit to 0% and click Apply. 6. Reboot your computer and enjoy. yes its not going to boost as much speed as ur thinking.. but.. it will increase a bit more.. Thanks ankit, I had tried this on my PC too, acutally it doesn't boost as much speed that we look for now.. but it bypass the Extent services so as to increase the speed.. It will only reduces the bandwidth used by Microsoft updates or other service if started or running (Mostly doesn't run cause ppl turn off updates). So it will not effect any more so do not use BOOST.